Hooked on Exchanging recently had a Prairie Schooler Exchange that I just had to join. I love Prairie Schooler designs and they are so fun to stitch! After receiving the gorgeous needlework smalls set that Barbie stitched and sent, I couldn't believe that I was treated to another wonderful set, this time from Hazel! It is a beautifully stitched and assembled needlework set complete with scissor case, fob and needle case - fully stocked with pins and needles, of course! I have had this chart in my stash for a long time but every time I thought about stitching it up, the thought of trying to finish that scissor case totally intimidated me! I just love it and it is even better because it is already finished! 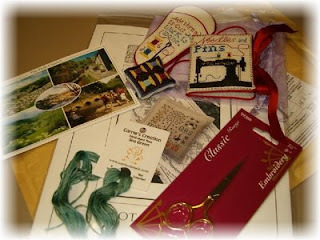 On top of the fabulous stitching set, she completely spoiled me with the extra goodies. She included a new pair of scissors (I didn't have any of these in my collection) that I immediately dressed in the fob and inserted in the scissor case. She also sent a Drawn Thread chart from my wishlist (now my set of the four seasons is complete! ), beautiful Sea Green hand-dyed floss from Carrie's Creation (I love soft shades of green) and a lovely postcard of her area. Hazel, thank you so much for this delightful gift - and especially for all the hard work and obvious effort that you put into making it! 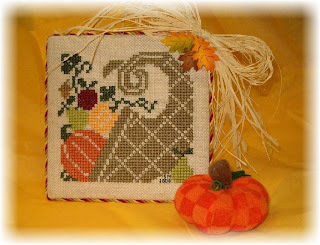 I stitched for Cathy B this time and chose the November design from Prairie Schooler Book No. 23 "A Prairie Year II". I used Wichelt-Permin 18 ct Lambswool linen stitched over 2 threads using DMC floss. I changed the colors slightly to "brighten" it up a bit. 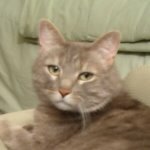 (I hope Cathy didn't mind the change!) I used a flatfold/easel type finish with some bright harvest print on the back. I really enjoyed stitching this up for Cathy and was pleased with the final result. That is one of the great things about this exchange group, the projects have to be completely finished so they actually get done instead of adding to my "someday" pile! 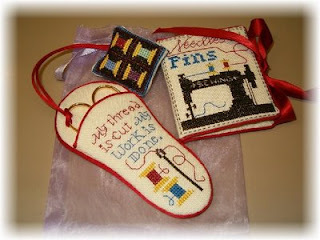 I sent along a few extras as well - a chart from Cathy's wishlist, a couple of pieces of 32 ct fabric, a packet of needles, a small assortment of thread drops, Chocolate Skittles (Have you tried these? Yummy! 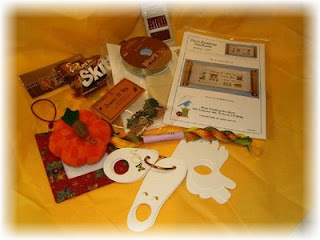 ), some fall -themed items: ribbon, embellishments, pumpkin stickers, a fun little checkered pumpkin and overdyed floss. 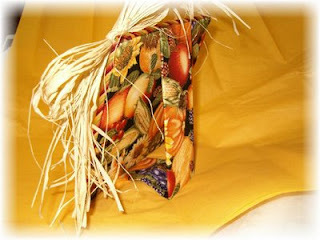 The last item didn't really fit the autumn theme but I sent it anyway - a small "tuckable" banner with a beaded hanger - I love these little banners - instant finishing and veeeery cute!! Well both the received and sent gifts are great. 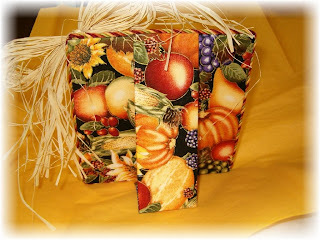 I have that scissor case in my stash and should really get it out and stitch it up. What a great gift and fabulous finish!!! 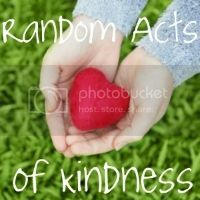 Would love to join a cross stitch exchange! How does one join?